Yesterday afternoon this lorry had a delivery to make but no where to park without blocking the traffic coming behind. The answer was to go on the pavement. It is not unusual to see vehicles mounting the pavement on the brae but it does happen on the High Street proper too, more generally just up from the brae as delivery drives seek somewhere to stop, but nowhere is really totally safe from this practice. Here's an example of just how dangerous this behaviour is. Hopefully Streetscape 2 will bring solutions? The lorry on the pavement only underlines one of the problems that the High Street faces. There's no such thing as an insoluble problem. All it needs is the imagination to think of options, and the political courage to pursue them. 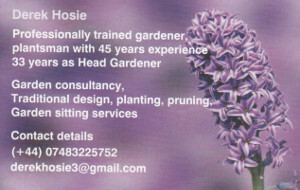 Sadly, Nairn isn't notable these days for either of these qualities. Since large trucks are apparently a major part of the problem, how about this for starters. Using the local Council's regulatory powers, introduce a ban on vehicles over a certain GVW (weight) and/or length accessing the High Street. This should not affect the local retailers much, if at all, since their consignments are usually small-scale. It might slightly inconvenience the major national retail chainstore outlets, which rely on bulk deliveries, but they have the resources to arrange their deliveries differently if they have to. Alternatively, or as part of such a scheme, if large trucks have to deliver in the area, designate a drop-off zone at, say, Balmakeith, and have the High Street shops use vans to collect from there. There are doubtless other possible options. 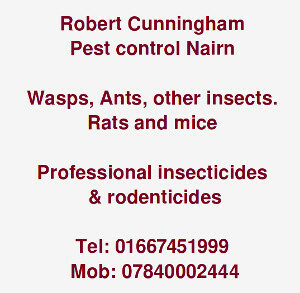 Why doesn't Nairn try some of them? Part of the problem is how other road-users park. Forcing the delivery drivers to park like that. Also that particular delivery comes all the way from Holland, so no real time come be sent when it arrives here. Of course maybe word of Sandy's retirement has reached Holland too? The same Dutch flower truck delivers to a shop in the narrow west end of Forres High Street too, causing some local difficulty. Old Scottish towns were never meant for this size of truck. Another example of 'one-size-fits-all' EU regulations? Or a Westminster government going along with everything from Brussels? Many areas do fine - pedestrianisation for a start would make it far less of an issue. However, the problem is that the High Street is a main through road to the rest of Nairnshire, not least Cawdor, so it inevitably gets a significant amount of further traffic. And those boffins who decided on expanding the county hospital but provide no extra transport provisions for it will no doubt see the High St get busier with traffic yet. All the more reason why Nairn needs a by-pass, though that looks like a pipe dream for now. Making our High Street a pedestrian only area would only increase Nairn’s problems as has been stated many times before. 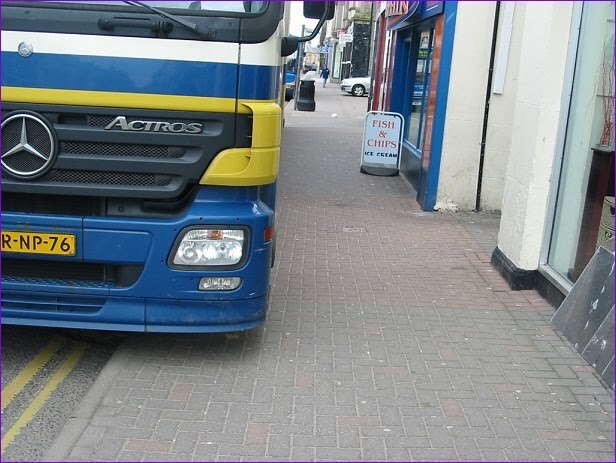 Shops need to give access to lorries in order to take deliveries, mixing lorries with pedestrians is not a good idea. In larger towns bigger retail units can demand deliveries outside of the main shopping day, but in the case on Nairn you would also be losing precious parking spaces, not only for those wanting to shop in the town but also those who live in the many residences on or just off the High Street. I doubt that a Nairn by pass would have any impact on deliveries to shops on the High Street either? I can certainly recall plenty of times I've been in pedestrianised retail areas where lorries have required access to load from the front. It doesn't cause a problem - and certainly not by comparison to having heavy traffic regularly running through the town. I really don't understand people's worries about pedestrianisation - it's a challenge lots of towns appear to have successfully addressed, and it's difficult to see how Nairn is so unique that it cannot work here. The arguments against seem to be fears or concerns, rather than actual practical arguments. I'm under the impression that pedestrianisation is a proven method for encouraging retail activity because of the increased safety for shoppers. But ... regardless, arguments for or against pedestrianisation are moot as it's not immediately happening - but we seem to have to expect to see lorries on pavements continue to be a problem after the new streetscape. Which certainly does not offer the safe shopping environment that part-pedestrianisation was supposed to offer in the first place, and thus essentially defeats the whole objective in the first place. Which means if Nairn ever does want to pedestrianise in future, is there really going to be any cash left to dedicate to it? One way or another it was lucky we had access to funding this time. There's no guarantee we will be with more definite plans on the table. Speaking of which, as the Brae has been redone with grey granite and the high street has already enjoyed extended pavements in red brick, does this mean all prior red brick work has to be ripped up in order to make room for the new stone design? If so, that would not sound very efficient or cost-effective planning at all. Or will we end up with red brick and grey granite running together? Either way, as the opening post - one of a series - demonstrates, instead of having a solution to a problem that pleases everyone, Nairn seems to have opted for something that pleases nobody! I can only hope my inherent cynicism is wrong about Streetscape, but it's hard not to feel that Nairn has been let down by timidity and poor planning decisions. In the meantime, the expansion of the town and county hospital has to be viewed as a positive development, but it isn't a small expansion - check out the size of the expansion, and the number of services, both frontline health services as well as back end administrative, that are moving in. That is going to make the High Street and Cawdor Road potentially busier, even though it means passing by the town's two primary schools. Any kind of additional road system - a by-pass or ring road - would surely help reduce this traffic pressure by ensuring external traffic can access key services without having to drive into and through the town centre. One of the more interesting points raised by the recent development plan issues is that a section of land to the south of the town is marked for potential development, but it has already been highlighted that such development would be absolutely dependent on a ring road or by-pass to ensure existing traffic systems can cope with access. Altogether, I sincerely hope the coming changes certainly prove worth their investment, but I can't help but feel that it's been an opportunity lost, simply to appease people who demand the right to park directly outside of the shops they spend their money in! Interesting debate coming in today, a lot of it territory we've visited a few times before on the Gurn but still valid debate. Hundreds of cars come up the brae and along the High Street everyday, I suspect that many drivers simply do this as it is the safest and most convenient way of reaching their destination. Others will try and park there before heading for the,often over subscribed, car parks behind the High Street. Research should have been done a long time ago into the numbers of vehicles using the brae and High Street and where they go. Otherwise are we just having a shot into the dark with the Streetscape's million pounds? It won't help that there's a lot of residencies down the side lanes off of the High Street and Brae - a much larger number than people driving past would guess, and most of them without supplied parking spaces. The Bank of Scotland and Somerfield car parks are useful for these people, but there's still probably a lot of them having to drop people off, pick them up etc. And don't forget the residents of Church Street and Mill Road - just how would they get access to and from the A96 if there were restrictions on accessing the High Street? More traffic for Waverly Road perhaps? Jacob the lorry driver from Amsterdam. Interesting discussion... but the debate does tend to mix up a range of different issues. I suspect it is widely agreed that the long-term solutions to the problem include a bypass, probably the pedestrianisation of the High Street, and a sensible, integrated and imaginative redevelopment of the Somerfield site and car park area etc which complements and reinvigorates the High Street and doesn't simply erect a larger supermarket or large blocks of housing. Meanwhile there are immediate problems to be addressed and alleviated. The heavy lorry and delivery issue is one. Residents' access and parking is another. Pedestrian safety and convenience is a third. Action could be taken which would ease some, or all of these problems. Sadly the streetscaping won't help: it really is a pity so much money will be spent, and so much disruption caused, for so little benefit. The planners should be ashamed both of their timidity and their lack of imagination. There is little merit in spending money simply "because it is on offer" if the net outcome is to deliver no real improvement. The issue of large trucks causing problems when delivering to the High Street is not likely to be solved by the Streetscape - I am always amazed how many vehicles seem to be able to access the 'pedestrianised' parts of Inverness city centre. There are two possible options. We can police the parking, or more specifically, the loading bay areas in the town to make sure they are not used for general car parking but, with the traffic warden not being replaced, I'm sure the police have better things to do. An alternative could be to offer the drivers of larger vehicles a dedicated loading bay, where cars don't park at present, within easy reach of the High Street itself. The only area suitable for this would be the Falconers Lane/ Fairlie Lane loop into and out of the supermarket car park. This is easily accessed from the A96, even for full artics ,and there is space for a loading bay without restricting other vehicles, even trucks. It would mean the drivers would have to cart the stuff through to the High Street..........but it could solve a lot of issues. "More traffic for Waverley Road perhaps?" Indeed - I think the entire crux of the matter isn't one of pedestrianisation or not, but one of access. While ideally I think pedestrianisation is a good thing, I'm also painfully aware that this would create a major traffic run through Waverley Road - though I think we're going to see more traffic there because of the expanded hospital anyway. Discussion on pedestrianisation aside, I think the one thing we may be more likely to agree on is that a Nairn by-pass could address more than just the immediate problem of congestion on the A96 - it has the potential to unlock other transport issues affecting the town. Perhaps if we can see the by-pass come to pass, the entire situation of Nairn's transport links would look a lot different. So why suggest it in the first place? new perfume, etc etc, but just now & again have a wee thought to yourself & think how fortunate you all are compared to others in this world who would love to have your problems. Aye Welcome to Nairn / Fàilte gu Disneyland. And it is compared to some communities. 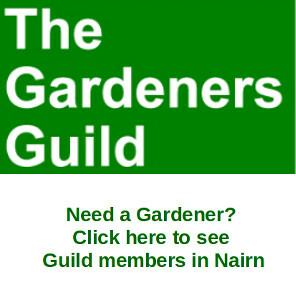 I think a lot of Gurnites are motivated by a desire not so much to preserve Nairn in aspic but to ensure it remains as nice a place to live for future generations. Hence the gurning, hence the vigilence, hence the desire for the best for the community. How on earth is the Nairn by-pass (if it ever happens) going to offer a solution to this immediate problem? If we are going to speculate in the realms of fantasy might I suggest that shops and shoppers look forward to the day when the new Nairn space station will just beam goods into our stores? I think that 'Thought' has missed the point and the very essence of the Gurn! Use the money to Dismantle the Court house, rebuild it beside the Museum in viewfield. That will leave a nice big gap leading from the A96 car park for all the lorries to deliver goods to the edge of the high st. Pedestrianise the High st and have goods taken to shops with electric low loaders. "There's no such thing as an insoluble problem"
Yes there is Archie Tect, how would you solve world peace or poverty for example? The list is endless! "Pedestrianise the High st and have goods taken to shops with electric low loaders. Aye and as has been said several times what about us folk that live on or just off the High Street? Hey! Let's get the UFO's to deliver them. In exchange for a few specimens to do tests on and such like. I am willing to offer myself up - but I have tried and they keep turning me down. Sob! to E FP LPED PECFD EDFCZP ... I thought the idea is to keep lorries away from the brae and the high st. The high st residents could surely walk from the car park, or have special permits for residents only. problem still solved ? As it happens I saw another good reason today for a Nairn bypass A foriegn lorry took the front wheel off a car coming up from harbour st trying to cross at the A96. A bypass, and the lorry wouldn't have been there ! "A bypass, and the lorry wouldn't have been there !" Help ma Boab! I switch on the Gurn for a wee quiet Sunday read but it looks at those WWIII has been declared? It is perhaps in the way for all of half an hour but here folk are wanting to spend millions of pounds to solve what at best could be called a slight inconvenience! Let's also hope no pedestrians get squashed on the brae too! "Let's also hope no pedestrians get squashed on the brae too!" I got rid of my car 6 years ago and I live off the high st, more people should try it . I dont work for the planning dept, my initial comment was tongue in cheek, but meant to show that where there's a will there's a way.Solutions can be found, but not if they keep throwing money away in senseless projects ! "I live off the high st, more people should try it"
tastes to suit all, the pickled eggs a pure delight, but the ambience is slightly lacking. I've really nothing to say on the subject but wondered if I might leave a comment in a hope that I'm assisting the Gurn with what seems like an all time record for comments?! Oh, if only we lived in an ideal world – but we don’t. Not everyone is in the position to be able to give up cars; for example, some people still have to go to work and have to have some means of transport as they are not always able to rely on public transport or borrowing someone else’s car. Also many who live in the High Street area do not have the luxury of garages or driveways to park cars in. Forget pedestrianisation, it’s not an option and if we ever went down that route you may as well put the closed signs up as it would kill the High Street. One last thing, pavements are for people not cars, lorries or huge trucks, oh, and bikes! Yes it seems like a comments record, obviously the Streetscape and traffic issues in the High Street and Nairn generally are hot topics around town. It looks like nobody got what they wanted from the brae development, will the same thing happen with Streetscape? We have no choice, we are going to get it whether we like it or not so all we can do is wait and see. As it happens I saw another good reason today for a Nairn bypass. A foreign lorry took the front wheel off a car coming up from harbour st trying to cross at the A96. The Harbour Street/A96 intersection surely deserves a new blog entry and separate discussion. The present junction control, by pedestrian-controlled lights on the A96 (only) and box markings, is confusing and dangerous - to residents, foreigners and pedestrians alike. A proper four-way set of synchronised lights controlling both Harbour Street and the main road, and linked to the others rather than randomly switched by pedestrians, would be safer, and would ease the peak-hour blockages. The sad fact is that even the death of a road-user (that cyclist at Sandown) doesn't seem to be enough to get the planners to take sensible action to deal with such A96-related problems.